Despite the growth in Sri Lanka’s tourism industry fuelled by increasing tourist arrivals from China since 2009, the number of Chinese tourists remains negligible when compared to the numbers of Chinese tourists travelling to other countries. Sri Lanka can and should take concrete steps to multiply its incoming tourists from China. N.R Ravindra Deyshappriya writes. Tourism is widely recognised as one of the world’s largest and fastest growing industries, accounting for approximately 10% of global GDP, and employing a growing workforce of 283.5 million, as highlighted by the World Travel and Tourism Council. Despite the growth in Sri Lanka’s tourism industry since 2009, fuelled by increasing tourist arrivals from China, the number of Chinese tourists remains negligible when compared to the numbers of Chinese tourists travelling to other countries. Sri Lanka can and should take concrete steps to multiply its incoming tourists from China. In 1966, tourism was recognised as a key industry of Sri Lanka. The Sri Lanka Tourist Board (SLTB) Act No. 10 of 1966 established a national institution to promote tourism in the country. Sri Lanka’s natural beauty and diverse landscapes, contained within a relatively small area of 65,000 km² (around the same size as Ireland and Croatia), provides a valuable resource for the country’s tourism industry. Sri Lanka’s attractiveness to tourists is further strengthened by its historical attractions, including ancient Buddhist cities, and its cultural diversity. 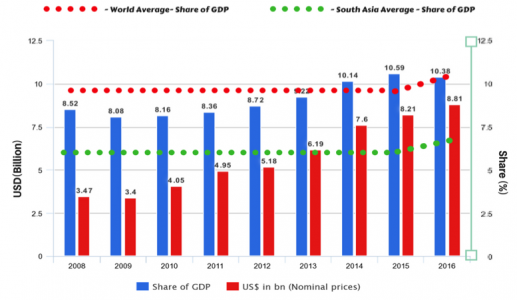 As shown in figure 1, the tourism sector’s share of GDP in Sri Lanka has been well above average levels in recent years, both in South Asia and globally. The tourism sector is also the 3rd largest foreign income earner for Sri Lanka. The total contribution (both direct and indirect) of the tourism sector to Sri Lanka’s economy is significant and growing, standing at 11.1% of GDP in 2014. This was equal to LKR1093.6 billion in 2015, an amount that is estimated to increase up to LKR 1979.2billion by 2025. The larger contribution of the tourism sector to the Sri Lankan economy, especially after 2009, is attributable to the greater political stability enjoyed by the country. However, Sri Lanka is comparatively lower than regional competitors such as Maldives (78.1%), Thailand (19.3%) and Malaysia (14.9%) in terms of the tourism sector’s share of GDP. The tourism sector serves as an important source of employment in the country, which is evident from the number of employed people in this particular sector. The rapid boom in the tourism sector had created 819,500 employment opportunities (both direct and indirect) in 2014, which was 10.0% of total employment in Sri Lanka, and which is expected to increase up to 943,000 by 2025. 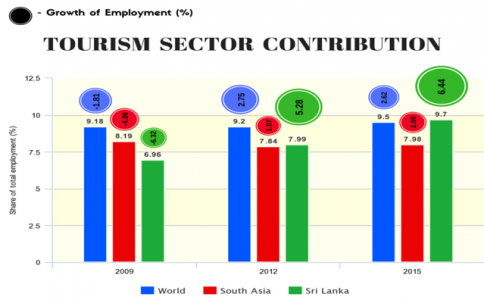 Similarly, as indicated in figure 2, the tourism sector accounted for 9.7% of total employment in Sri Lanka in 2015, which is higher than the corresponding percentages in the world (9.5%) and South Asia (7.98%). More importantly, the growth of employment in the tourism sector has dramatically increased, from -6.32% in 2009, to 5.28% and 6.44% by 2012 and 2015, respectively. Figure 2: Tourism sector contribution to employment. Source: Created by the author based on WTTC. As figure 3 shows, significant changes have taken place in the composition of tourist arrivals to Sri Lanka over the last three decades. In the period 1984 – 1994, Germany held the number one spot in Sri Lanka’s tourist arrivals. Until 2004, Germany, India and the UK were the ‘top 3’ countries among Sri Lanka’s tourist arrivals, and China’s contribution to local tourism was insignificant. In 2014, however, China rose to the rank of Sri Lanka’s 3rd major tourist partner, accounting for 8.4% of total tourist arrivals. It climbed another notch in 2015, nudging out the UK to claim 2nd position. The main reasons for this increase were intense advertising campaigns launched in China by the Sri Lankan government, greater engagement with the Chinese media, the peaceful environment in Sri Lanka, and stronger political ties between the two countries, Since 1984, India has been among the top 3 sources of tourists to Sri Lanka. It recently claimed the number one spot, but the sharp rise in Chinese tourist arrivals could change that situation in the near future. Figure 4 presents both the number and growth rate of tourists from the major source countries, in the five year period 2010-2016. While the largest number of tourists in that period came from India and UK, in that order, the number of Chinese tourist arrivals increased dramatically after 2013. Figure 4: Tourist Arrivals and Growth Rate of Tourist Arrivals from Top Five Countries (2010-2016). Source: Created by author, based on data from the Sri Lanka Tourism Development Authority. Aside from the absolute number of tourist arrivals, the growth rate of tourist arrivals shows the potential significance of China as a tourism partner of Sri Lanka. 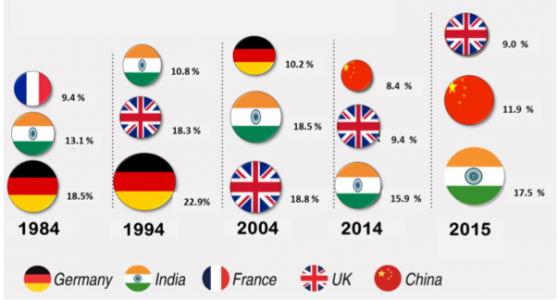 As figure 04 depicts, Chinese tourist arrivals grew by a remarkable 72.5% in 2010-2016, while Indian and UK tourist arrivals increased by only 19.3% and 10.3%, respectively. Furthermore, tourist arrivals from China increased by 68% in 2015 compared to 2014, while Indian tourist arrivals grew by only 30%. The above trends indicate that there is a high possibility that China will become the top tourist partner of Sri Lanka in the near future, thereby relegating India to second position. The growing trade and investment relations between China and Sri Lanka can also create ample opportunities for the expansion of tourist arrivals from China. How popular is Sri Lanka among Chinese tourists? Despite the impressive growth rate in Chinese tourist arrivals to Sri Lanka, these numbers are negligible in comparison to Chinese outbound tourism to other countries. Even though Sri Lanka was among the top 25 tourist destinations of Chinese travelers in 2007, it no longer holds this valuable position. 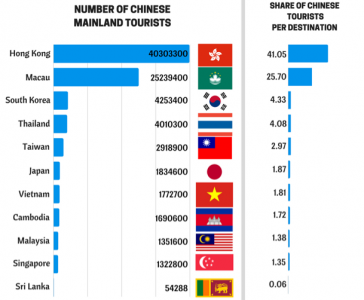 The top 3 tourist destinations for Chinese tourists are now South Korea, Thailand, and Taiwan (not counting Hong Kong and Macau, which are special administrative regions of China). Only a meagre 0.66% of China’s total outbound tourists travelled to Sri Lanka in 2013. It is also notable that the Maldives receives 5 times more Chinese tourists than Sri Lanka (302,400 in 2013). Figure 5: Chinese outbound tourism in 2013. Source: Created by author based on the data from the Sri Lanka Tourism Development Authority and www.travelchinaguide.com. What can Sri Lanka do to attract more Chinese tourists? Cultivate tourism-friendly ‘soft power’ by recognising and celebrating festivals such as Chinese New Year, which are increasingly global. In a similar vein, organise creative, crowd-friendly events such as a Chinese ‘street food’ fair and a Dragon Boat Festival, which signal Sri Lanka’s receptiveness to Chinese culture. Cover image: View of fishing boats in Sri Lanka. Photo credit: Goran tek-en, CC BY-SA 3.0. The opinions expressed in this article are the author’s own and not the institutional views of LKI or RMIT University. They do not necessarily represent or reflect the position of any other institution or individual with which the author is affiliated. The author thanks LKI staff for their valuable comments on this regard.